Charlie Walbridge has been on the Friends of the Cheat Board for 12 years and played a role in the Access Project. Friends of the Cheat is a watershed organization formed “to restore, preserve, and promote the outstanding natural qualities of the Cheat River watershed.”Charlie serves on the board of directors of Friends of Cheat. 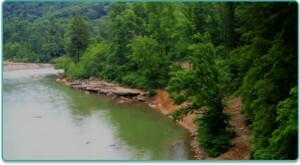 Here’s a description of our recent efforts to protect access to the Cheat River and Big Sandy Rivers at Jenkinsburg, WV.The Jenkinsburg project was a successful partnership between a private landowner, two river-oriented non-profits, two state environmental agencies, several canoe and kayak clubs, and hundreds of donors from West Virginia and the surrounding states. In 2003 the State of West Virginia made a strong effort to purchase the spectacular Cheat River Canyon. After they were outbid by Allegheny Wood Products (AWP), a large logging company, river access became an immediate concern. AWP now owned Jenkinsburg, the site of an old logging town, which had been used by paddlers since the mid-1950’s. It’s the only takeout for the Cheat and Big Sandy Rivers, both popular whitewater runs that draw thousands of canoe, kayak, and rafting enthusiasts to the area each year. It is also a popular place for swimming and picnicking in the summer. But the area has also been the scene of considerable abuse. Heavy use by ATV riders and college party groups had caused considerable damage over the last two decades. The area has been notorious for waist-deep mudholes and industrial-strength litter. A group of organizations that had worked together to support the state’s purchase effort, contacted AWP immediately after the sale. They offered to raise money to fix up the area at no cost to the company. This effort went nowhere because AWP was unwilling to agree to a long term lease, without which fundraising would be impractical. After an initial meeting and a tour of the area with company representatives, meaningful contact ended. Their key people were now “too busy” to discuss things further. Although the access remained open, the company regularly threatened to fence it off and shut it down. After they had closed the Allegheny Trail through the Cheat Canyon with no prior notice to the organization maintaining it we took these statements very seriously. Some months before the Cheat Canyon purchase effort a piece of privately owned land at the upstream end of the Cheat Canyon came on the market. The parcel, running the length of Decision Rapid on river right, had been owned for several decades by Mountain Streams and Trails Outfitters. The company had fallen on hard times and was now up for sale. This land was purchased by Dave Hough, a member of the group that bought the company. Later, when AWP decided to convert an old railroad grade into a haul road, they met with Hough to discuss their plans to reopen a right-of-way that ran through on the upper portion of the his property. It was then that Hough expressed interest in purchasing the Jenkinsburg Takeout. After months of negotiations AWP agreed to a land swap, exchanging the portion of his property above their haul road for an area between the state road and the Cheat and Big Sandy Rivers. Hough saw possession of the takeout was only a first step. He wanted to allow public river access, but he also wanted to put a stop to the atrocious littering and land abuse that had become the norm here. He wanted it to become an attractive place, an asset to his business and a source of pride to the community. He’d participated in Cheat Canyon Coalition meetings when possible strategies for managing Jenkinsburg were discussed, so he approached Charlie Walbridge, an American Whitewater board member active in the Coalition, to ask for help. Walbridge, who also works with Friends of the Cheat, immediately discussed this with their Executive Director, Keith Pitzer. Both men were former river guides and long-time paddlers who knew the area well. 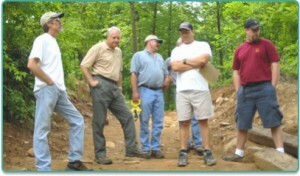 They were excited to have a landowner who was willing to join forces with them and ready to begin work. The first challenge was funding, and here the two groups quickly found a valuable partner. 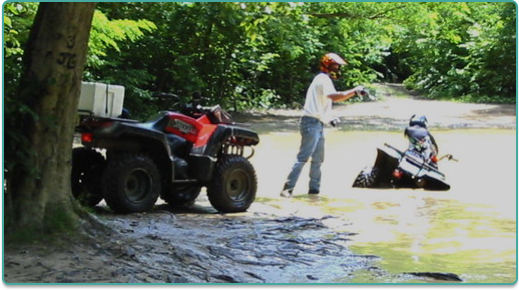 Over the years Pitzer had managed many acid-mine remediation projects locally and developed a solid relationship with the West Virginia Department of Environmental Protection (DEP). He believed that our work at Jenkinsburg might qualify for EPA 319 money. This funding is provided to the states to deal with non-point source pollution like the massive erosion at the Jenkinsburg site. Agencies like the DEP, which deal with huge projects costing many hundreds of thousands of dollars, often have 10-20 thousand dollars remaining in these accounts at the end of a fiscal year. While not enough money to fund another major project, these sums could be very helpful on a job the size of ours. Lou Schmidt, a DEP water quality expert familiar with the area, made several site visits and presented the idea to his superiors. After considerable study they told us that the project qualified for a matching grant of $15,000. There was only one catch – we had to raise at least $10,000 in private funds in just 30 days! Fundraising, which American Whitewater had begun soon after the land transfer, now went into high gear. Friends of Cheat, with it’s well-managed office and credit card capabilities, became the hub of the effort. Our main vehicle was an Internet campaign. Appeals were posted to whitewater club websites and chat rooms, regional message boards like Local Paddler, and national forums like Boatertalk and the American Whitewater website. We also encouraged interested people to copy our message and forward it to their paddling friends. At Cheatfest, one of the largest river festivals in the country, we offered “Cheat River Access Sponsor” stickers to encourage small donations. Ten $500 donations came from whitewater paddling clubs and individuals; the rest of the money came in donations of $100 or less. In all, we raised $12,000 in just 30 days. Working through the West Virginia Wildwater Association we applied for, and received, a $1000.00 grant from the American Canoe Association’s CFS fund. Sponsored by LL Bean, these grants are designed to provide quick cash for worthy river access projects. That, combined with the $2000 raised by American Whitewater, put us way over the top. Dave Hough signed a 20-year access agreement allowing non-commercial access through his land in return for these donations. During the preceding months a plan for the area had been developed. 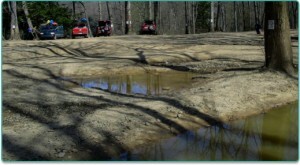 The upper parking lot would be enlarged, then ringed with huge rocks to cut off ATV access to the rest of the property. The lower lot would also be expanded, and the road to it straightened out to accommodate outfitter busses and equipment trucks. This road would be gated, and a graded path created for river users from the upper lot to the river. All access beyond the upper parking area, except for authorized outfitter vehicles, would be on foot. At the same time all the badly eroded and trampled areas would be seeded and mulched. The DEP created a bid package, and the winning bid was submitted by Allenwood Construction of Clarksburg, WV. The project was managed by Friends of Cheat executive director Keith Pitzer in consultation with the outfitters, American Whitewater, and the West Virginia DEP. Construction began on August 22nd, and aided by a spell of dry weather took only eight days to complete. First he upper parking lot was graded to carry water away from the bridge and into a nearby bog. All the mudholes were drained and filled, including a deep one where a big sport utility vehicle would sink clear up to its windows! Then huge rocks were plucked from the edge of the county road right-of-way and carried to the upper parking lot, forming a long lasting barrier to vehicle access. Illegal four-wheeler trails from the road below the switchback were also closed off with large boulders. The road to the lower parking lot, once passable only by four-wheel drive vehicles, was graded and straightened to accommodate outfitter busses and trucks. The lower lot was expanded so that several companies could load trips simultaneously, and the path to the main takeout at the mouth of the Big Sandy River was hardened to resist erosion with a special honeycomb fabric. Then the big dump trucks started rolling and a thick coating of gravel was applied to the lots, the road, and the trail. At the last minute AWP contributed $900 to get a giant mud wallow on their property across the road graded, filled, and mulched. Donate to fix up Bull Run Road. Every Dollar Counts. See what’s going on.